Happy weekend everyone! How was your week? Do you have anything exciting going on this weekend? I hope so! I have something a little different for you today. We are going to take a break from eating for a moment and talk about something that is also near and dear to my heart – fitness! 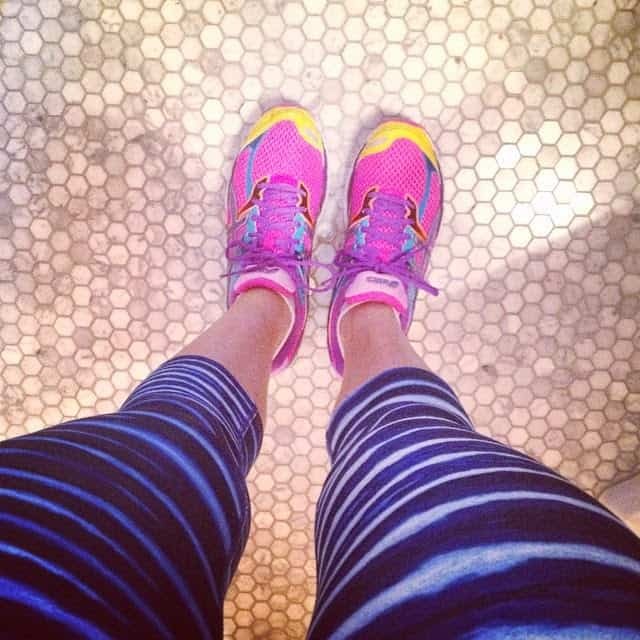 I don’t talk about fitness very often here on the blog. But this is something that is extremely important to me. Even when I am travelling. Travelling, while fun, can also be stressful and the best way I find to relieve some stress is to sweat it out! Anyone else agree? My mind is never more clear than after a good workout. 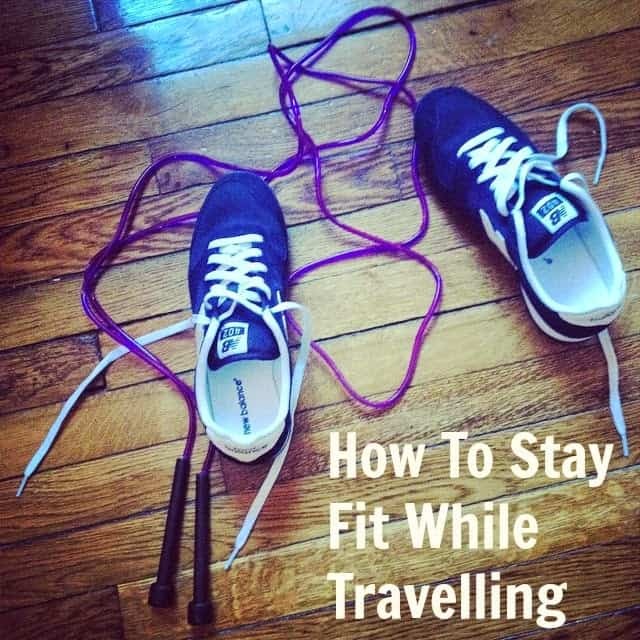 But I realize that staying fit while travelling can be a challenge so I thought I would share my tips for staying in shape while you are on the road, the things I pack to help me stay in shape, and some of the workouts I did when I was in Boston a couple weeks ago to give you some inspiration for your next adventure. My first tip is to pack a few essential fitness items that you can use anywhere. Now the key to packing fitness items is that they need to be light! If you are like me your suitcase is always skirting that 50lb weight limit so you don’t want your fitness essentials to be the items that put you over. My first recommendation is to pack a good pair of running shoes. Now when I am at home I have different shoes for different workouts. I rely on my Mizuno Wave Riders for running and my Nike Free Tr’s for interval or cross fit type workouts. But I realize that packing two pairs of running shoes is ridiculous so I usually only pack my Mizuno’s when I am travelling. The next item I always pack is a skipping rope. Skipping is one of my favourite types of cardio. Nothing gets my heart racing quite like a great set of double unders. I have tried many different types of skipping ropes. My current favourite is this one which can be found on Amazon. There are so many exercises you can do with a skipping rope so don’t be scared to change it up: high knees, cross overs, double unders, slow skips, single legs… changing up your routine will ensure you don’t get bored! If you have no idea what I am talking about I recommend this book to get you started. Next to go in my suitcase is a resistance band. Bands are a great way to get some strength training in while you are traveling. There are so many exercises you can do with a resistance band, and the great thing is that they come in different strengths, so as you get stronger you can progress from very light to very heavy resistance. The most recent addition to my travelling fitness essentials are Gliding Discs. Don’t laugh, but I actually saw these being used by various Victoria Secret models in preparation for the Victoria Secret Fashion Show so I decided to give them a try. And although the exercises look easy and you wouldn’t think they would be that effective they really are! These are a great way to target the little muscles in your legs and glutes (ie. bum) that can be difficult areas to train. I was surprised at how sore my legs were the first time I used these. You can get them for carpet or for hardwood surfaces and both can be found on Amazon. For my Canadian readers I actually bought mine on ebay since Amazon wouldn’t ship these to Canada so that is another place to check. The last item that I can’t workout without is a stop watch. I do a lot of interval workouts and timed exercises so I would’t be able to survive without a timer of some sort. I use a sports wrist watch for this purpose. There are a ton out there and you can find very cheap options at places like Target, Wal Mart or on Amazon. Yes walk. A pretty simple suggestion don’t you think? I rarely rent a car when I travel for conferences so I end up walking almost everywhere. Not only is this a great way to add some exercise to your day, but it is also a great way to explore the city you are visiting. If we think back to our caveman ancestors they did not have the convenience of cars, buses, trains or bikes to get them around. They relied on their own two legs. And if the whole goal of the paleo or primal lifestyle is to emulate how our ancestors treated their bodies, walking is one simple way to get back to your caveman roots. Pack a comfortable pair of walking shoes, stick a few Epic Bars in your bag (or another paleo snack of choice) in case you get hungry and get out there! Alright everyone that’s it! I hope you found this helpful! Let me know if you have any comments or questions. Will you start packing any of my recommendations? I hope so! And remember you can also find me on Pinterest, Instagram and Facebook. Have a great weekend!